You guys, it’s getting colder. There’s no denying that creep of autumn into Melbourne. Cool, dark mornings, days where it just doesn’t quite warm up, the re-emergence of evening socks. What, you don’t have evening socks? This is one of my favourite things to cook when the weather turns chilly (hell, it’s one of my favourites anyway) thanks to its one-pot (almost) easiness, its toasty warmness from the oven, and dat bechamel layer. I struggle having some kind of tomato-based pasta dish without a layer of CHEESE SAUCE, YO. Looks like a big ole bowl of nothing much exciting at all, I know. But it’s a party in your mouth, and hey, there’s spinach in it. Might as well be health food. rich tomato, fresh spinach, and creamy bechamel all make friends in this cozy dish. Cook pasta, according to packet directions, but take it off the heat and drain it a few minutes early – it will keep cooking in the oven. While the pasta is cooking, make the sauces. If you’re in a rush, you can throw all the tomato sauce ingredients into the larger pot later with the cooked pasta (with the bechamel on top) and it will cook together in the oven. In a large pot, saute the oil and garlic over medium heat in some olive oil until translucent, about 5 minutes. Add the tomatoes, sugar, salt, pepper, herbs, wine, and tomato paste and bring to the boil. Reduce heat and simmer to thicken and develop the flavours. over a low heat, melt the butter and the flour together and cook for about a minute. Add the milk and whisk quickly to combine and make sure there’s no flour lumps. Add the bay leaf, salt, and pepper and stir over a low-medium heat until sauce boils and thickens. Take off the heat to add cheese and check for seasoning. 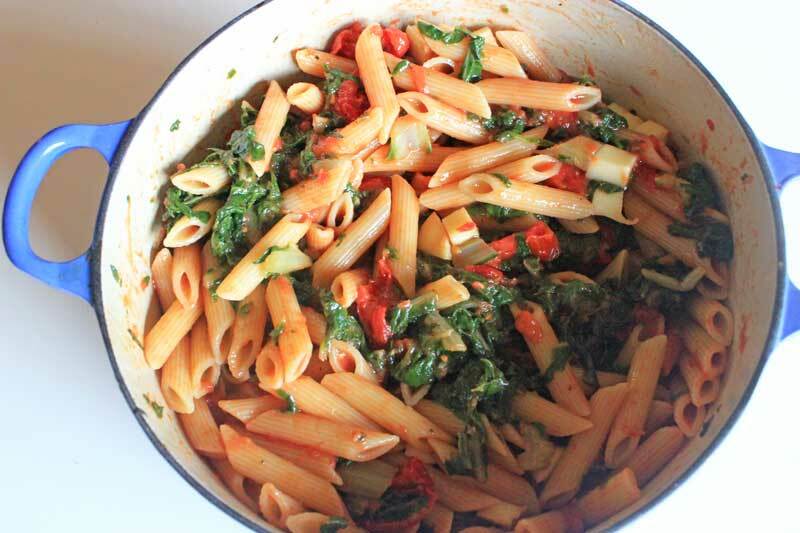 In a large, oven-safe pot, mix together the drained pasta and the tomato sauce. Top the pasta and tomato sauce with the bechamel, and sprinkle the last one cup of cheese over the top. Bake, uncovered in the oven, until heated through and golden and bubbling on top, about 20-30 minutes. Eat with an obscene amount of butter on a crusty loaf of bread alongside. This looks delicious, I’m not normally into veggie only meals, but I certainly could do this one. haha don’t let me sway you! 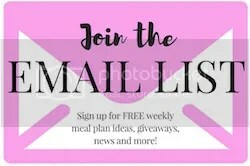 I’m doing this, your recipes haven’t steered me wrong yet! And it’s freeeeezing in Canberra! Hell yes I have evening/bedtime socks, and yes I have already cracked them out. oh Canberra must be icy already! Being a stay at home mum, my evening socks become 24/7 socks when the weather starts to cool down. I’m classy like that. And did you know you can freeze bechamel? I did not but someone told it’s true! 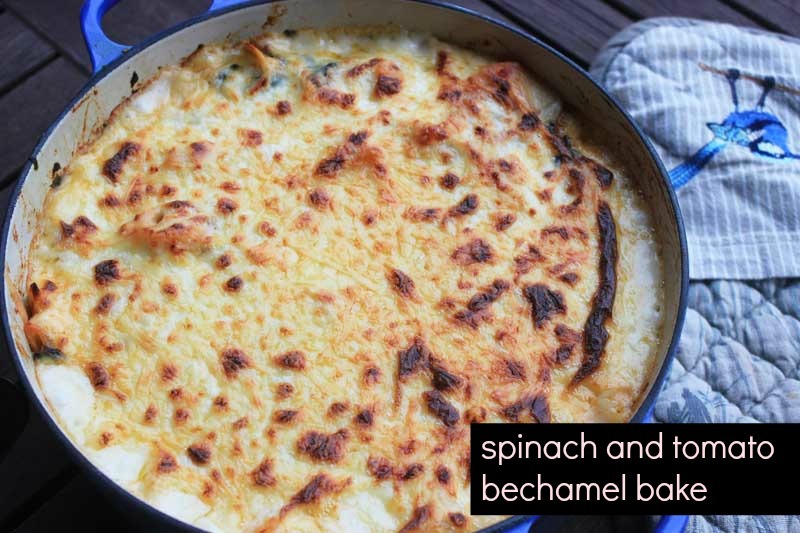 oh yes – i’ve frozen lasagne before and the bechamel is great! meanwhile… I think I’m gonna make lasagne for dinner. Thanks for the tip! Hell I’m in Tassie. We don’t muck around with evening socks. It’s uggies all the way down here. It’s considered high fashion in these parts – take a stroll to the mall at any time of day and you’ll find the natives parading their style. Mine are pink, for the record! But yes, I love tomato based pasta, cheese layers and spinach too. Yummo. Hahah I’m yet to wear my slippers outside but damn it’s getting cool here! So much cheeeeeese. Juni has just learned to say cheese. She says “tjeese” it’s pretty cute. I think she’d LOVE this! Wow. That looks amazing. I am drooling.